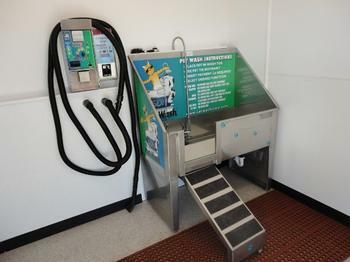 Crystal Clear Wash has Montrose's only self-serve pet wash, starting at just $5.00! It makes washing your pets quick, easy, and convenient. No more trying to hold Spot between your knees while you attempt to get shampoo on him. At CCW's pet wash, once you get your pet up into the tub, you just clip its collar onto a chain in the tub and you are free to wash at ease. You click through the dial to select what products you want to use. When you are through washing, you can test your pet's tolerance level with the blow-dryer or vacuum. We advise using one of our aprons because once you lead a dog to water, you can't keep him from shaking it all over you! 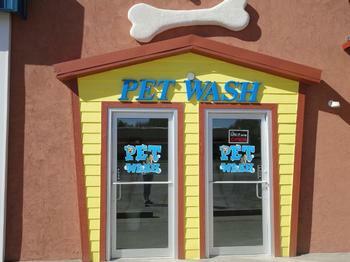 Come visit us today and see how much easier washing your pet can be. Don't forget to bring a towel! We accept cash, coins, credit/debit cards, or WashCard, our discount loyalty card. Visit the WashCard tab to learn more about this program.